I haven't been the best at posting lately. There are some good reasons for that...the first not so much but, the "cold bug" has hit our house. Tis the season for that in the midwest! The second is that you may have noticed a small depletion of my designs in my Etsy store. 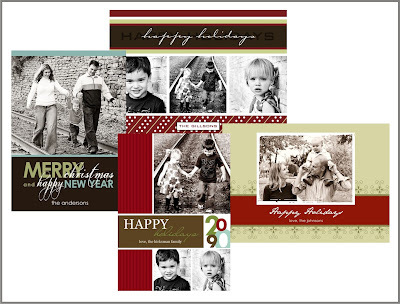 I was contacted by another online card company that wanted to carry some of my designs. Since I released a good 18 or so designs to them I've been busy designing new ones to restock the store. Since I work part time for a company and freelance I've been trying to create in between all of that. Anywho...I'm very excited about the company that asked, Photo Affections. They have a great preview option of the designs so you can see what your photo card will look like before you purchase it. Check them out and you may just see some familiar designs. Here are a few new Holiday card designs.